Laparoscopic sleeve gastrectomy (LSG) is an emerging surgical technique with encouraging results. The objective of this study is to report surgical results after 1,000 consecutive LSG cases as a stand-alone procedure for morbid obesity during a 3-year follow-up. Data were obtained by review of our prospectively maintained database, patients’ clinical charts, and phone interview of all patients who underwent LSG in our institution from December 2005 to February 2010. There were 773 (77.3%) women whose preoperative age and BMI was 36.9 ± 11.5 years and 37.4 ± 4.0 kg/m2, respectively. The most common co-morbid conditions were insulin resistance 55.1%, dyslipidemia 45.5%, arterial hypertension 23.1%, hypothyroidism 15.4% and non-alcoholic fatty liver disease 12%. Excess weight loss was as follows: 1 year 86.6%, 2 years 84.1%, and 3 years 84.5%. Early and late complications occurred in 34 (3.4%) and 20 (2.0%) patients, respectively. Reoperation was required in seven (0.7%) patients. There was no mortality during follow-up. 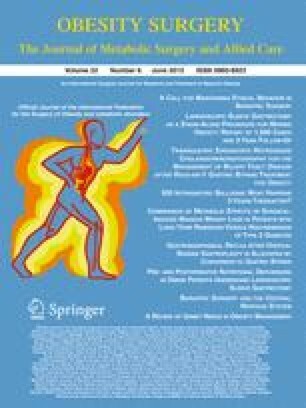 LSG seems to be a safe and effective surgical technique for morbid obesity as a stand-alone procedure. The authors of this study declare no conflicts of interest of any kind.